Has there ever been an athlete as untiring and inexhaustible? Has there ever been a man wearing tennis shoes as unflagging and indefatigable? While everyone, including Star Sports announcers Vijay and Allan, concluded that he’d be wearied and debilitated last Sunday—the opposite happened: the Spaniard was perky, hyper, vigorous. He was a Spanish ball of fire who, amidst the warm Melbourne air, burned and melted the cool Swiss Alps. Why is Rafael Nadal, against the man poised to be named The Greatest Ever, seem so unconquerable? Is it because of his muscles—that they’re bulkier and more robust than the lean figure of Roger? 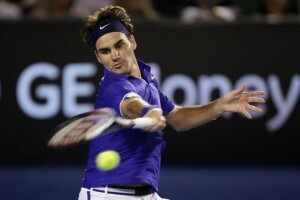 His left-handed spin that curves the ball from his stronger forehand to Roger’s weaker backhand? Is it the spin off his strokes that produce outlandish bounces never seen before? His mental strength. His heart. His spirit. His willingness to suffer pain, absorb it and transform that hurt from French Open trophy to Wimbledon plate to Australia’s Wizard of Oz. His unbending belief in himself. His desire. His dogged hunger. His passion to win, as he did in one of the most amazing points I’ve witnessed—at 2-all in the 4th set—to sprint from right corner to left wing multiple times, to twist his body, slide, scramble, sprint for a forehand winner. Tenaciousness, it’s called. Nadal, it’s personified. The opposite, I believe, holds true for Federer. While he mentally annihilates everybody else on the ATP Tour (think Andy Roddick, who’s lost to him 16 of 18 times), against Nadal, it’s RF who succumbs to a psychological breakdown. In mind games, RN “owns” RF. Do I still believe Roger will break Pete Sampras’ 14-slam record? Absolutely. Only 27 years old and owning 13 Grand Slam titles, he can, without a cinch, surpass that mark. The question is…. When? Will it be at Wimbledon when, after winning his 5th French Open crown, Nadal will be even more unshakable? At the U.S. Open when Murray and Novak Djokovic would have further improved? Another question—one that was posed the other night when Macky Michael, Dr. Ronald Anthony Medalle, Atty. Jovi Neri and myself watched together—is this: Can Roger lay claim to the “Greatest Ever” accolade despite a badly losing record against Rafa? Head-to-head, we know Nadal leads 13-6. Can RF be named Best Ever despite being second-best to RN? The answer, we concluded, is still Yes. Examined closely, on grass, they’re 1-2 (in favor of Roger) and, on hard-court, it’s 3-all. The remaining matches, it’s 10 of 19 on clay—a surface where Nadal is invincible. So, in due time, Roger will claim Major No. 14. 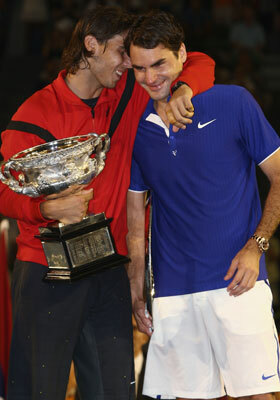 But, for now, there is only one champion—and two people smiling: Nadal and Sampras. Yes, Sampras is smiling. For now, his record stands. … Not for long, though. you’re absolutely right! not for long coz rafael nadal will surpass his record…he will continue collecting trophies, continues winning again and again wow….vamos rafa!!!!!! and oh by the way, the man poised to be named The Greatest Ever, roger federer, it’s just a wild dream, imagination of his die hard or avid fans…. :)hehehehehehhehehehehe oppppssss federer’s fans don’t get mad, coz it’s true!!! !